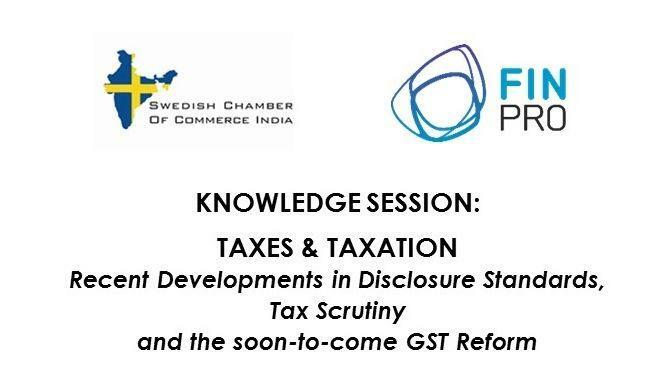 The Swedish Chamber of Commerce India and Finland Trade Center (Finpro) along with knowledge partner SKP Group invite you to an interactive discussion on “Taxes & Taxation”. Time: 9 – 11 am (Breakfast and networking will take place from 8:30 onwards). The event will be hosted by H.E. Mr. Aapo Pölhö, Ambassador of Finland at his Residence (Embassy of Finland, Nyaya Marg, Chanakyapuri, New Delhi 110021). The discussion will cover, among other issues - income computation and disclosure standards that are effective from 1st of April 2015, action plan on base erosion and profit shifting (BEPS) and India’s position on that, and recent trends in tax scrutiny. We will also focus on the current indirect tax structure in India for a service provider, trader and manufacturer, and the upcoming GST tax reform in India. Register here the latest by Thursday, October 1. For security reasons, please present a photo ID at the Embassy gate when entering the compound.